Engineer. Born in Glasgow, Stevenson was the son of a West Indies merchant. 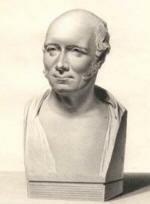 His mother, having been widowed, married Thomas Smith (1752-1815), the first Engineer to the Northern Lighthouses Board. Stevenson attended Anderson's College and the University of Glasgow. In 1797, Stevenson succeeded his step-father as Engineer to the Lighthouse Board. He held this post for 47 years during which time he was responsible for designing eighteen of Scotland's lighthouses. These were: Bell Rock (1811), Toward Point (1812), Southerness Point (1812), Isle of May (1816), Corsewall Point (1817), Point of Ayre (1818), Calf of Man (1818), Sumburgh Head (1821), Rhinns of Islay (1825), Buchan Ness (1827), Cape Wrath (1828), Tarbat Ness (1830), Mull of Galloway (1830), Dunnet Head (1831), Douglas Head (1832), Girdle Ness (1833), Barra Head (1833) and Lismore (1833). Robert Stevenson began a dynasty of known as the 'Lighthouse Stevensons'. Between 1790 and 1940, eight members of the family planned, designed and built 97 lighthouses around the Scottish coast. Robert was father of lighthouse builders Alan (1807-65), David (1815-86) and Thomas Stevenson (1818-87), and grand-father of the author Robert Louis Stevenson (1850-94). Other grandsons David (1854 - 1938), Charles (1855 - 1950) and great-grandson Alan (1891 - 1971) continued the dynasty. In 1880, R.L. Stevenson wrote: "Whenever I smell salt water, I know I am not far from the works of my ancestors. The Bell Rock stands monument for my grandfather, the Skerry Vhor for my Uncle Alan and when the lights come on at sundown along the shores of Scotland, I am proud to think they burn more brightly for the genius of my father." Stevenson was also involved in canal building, harbour and railway construction and suggested the use in railways of flanged wheels and flexible rails (as against the brittle cast-iron ones used previously). He also drained the Nor' Loch and built Regent Road around Calton Hill in Edinburgh.